What if airlines became players in the high speed rail program? 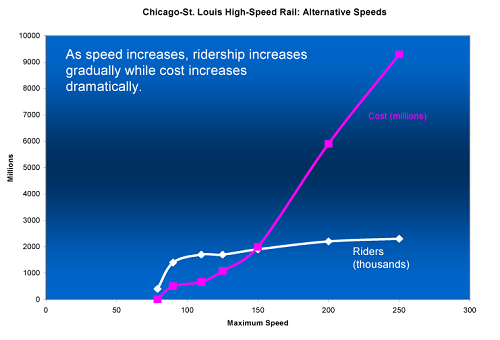 High speed rail competes primarily with automobile usage and with short distance air travel. What if a business model were developed that provided added profitable service opportunities for airline industry participation in high speed rail? Consider what might be possible. The original Transportation Economics & Management Systems, Inc (TEMS) study in November 2006 pointed out that reduced traffic congestion in and around airports would create significant benefits for airlines by improving airport efficiencies and reducing travel delay costs. Since the time of that study, airline fuel costs have risen substantially. It appears harder now for airlines to operate short distance flights profitably. Although the data showing route profit (or loss) per passenger mile by trip distance is hard to come by, the fact that airlines continue to announce service reductions or eliminations of shorter flights clearly suggests that the flights of 300 miles or less are not profitable. But what if airlines could find a way to move those unprofitable airborne flights (and their customers) to the rails? Airlines could own and operate high speed rail cars. Airlines would pay destination fees ("landing rights") to Amtrak for the use of Amtrak "runways." Airports would become multimodal and offer gates to serve both planes and high speed trains. The system would be designed to offer both pre- and post-security clearance travel options. Post-security clearance train cars would discharge passengers behind the security clearance system directly into the concourse from a gate, just like arriving planes do at the destination location. Pre-security clearance cars would not, but both varieties of service could be offered on the same train, provided the system allowed for passenger separation by security status. City centers and airports could be linked to allow airlines to "fly" passengers to city centers as well as to airports. Speeds of 110 MPH would be relatively competitive with air travel for these shorter distances, particularly if travel were linked to urban centers. Advocates for high speed rail face an uphill battle to expand high speed passenger service. As long as HSR appears to expose public sector sponsors to weak infrastructure utilization rates or to be dependent on significant public operational subsidies, high speed rail is likely to gain inadequate support in this country. For that reason, a strategy to involve commercial airlines could hold significant promise. If a cost effective business plan were developed to migrate commuter airline passengers to air-carrier-operated "train-planes," then everyone could be a winner. This is especially true if the plan could attract more passengers for the urban core to urban core travel segment. The airlines and Amtrak would both generate more revenue, and significant numbers of travelers would have shifted from auto travel to "train-plane" travel--with all the attendant benefits to individuals and to society that this alternative would offer. Finally, the returns on the initial capital outlays would have been greatly leveraged.